The Malawi Human Rights Commission (MHRC) has asked President Joyce Banda to institute “credible and impartial investigations and prosecution” of police officers who shot killed and injured civilians during the July 20 anti-government protests last year. The report also singles out Malawi Broadcasting Station (MBC) for unfair reporting and bias towards government on both TV and radio during, and after, the demonstrations. The commission also blames the presidency for making provocative remarks that further fueled the tension around the demonstrations. 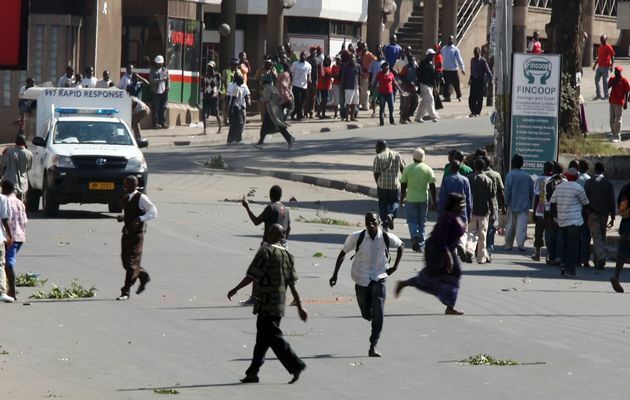 Among many of the recommendations made, the MHRC urges government to institute “credible and impartial investigations and prosecution” of police officers who shot killed and injured civilians and also citizens who were involved in the looting and destruction of property during and after the demonstrations. The report, bearing the signatures of all commissioners headed by out-going chairman John Kapito, says as a state party to major international human rights treaties, the Malawi government should ensure that human rights, human dignity and freedom are protected in all circumstances. MHRC recommends that government should ensure that victims of the July 20 demonstrations, including those who were subjected to violations of their rights, “access effective remedies”. “The commission cannot determine exact remedies but institutions with appropriate jurisdictions such as the courts will determine the remedies accordingly.” In an interview, Kapito said that it was important for government to adopt new mechanisms for peaceful settlement of disputes and for the president to provide and maintain channels for contact and dialogue with the people. The report further calls for Malawi to inculcate in government a culture of tolerance as one way of ensuring that demonstration become last resort for people to communicate contrary views. MHRC also observed a lack of capacity in the Malawi Police Service where need still exists for relevant training, resources and generally the numbers themselves. The police-officer-citizen ratio in Malawi is currently at 1-1,350 according to police inspector general Lot Dzonzi. The MHRC has also urged civil society organizations (CSOs) to give dialogue a chance before calling for demonstrations and also ensure meeting threshold set in the Police Act in planning of demonstrations. “(They should also) intensify civic education and disseminate adequate information before conducting demonstrations (and) plan demonstrations properly on timing, routes, meeting places, points of dispersal, consultations with relevant stake holders,” reads the report which also attacks public broadcaster Malawi Broadcasting Station (MBC) for bias towards government on both TV and radio. It has also urged the judiciary to take caution when granting exparte injunctions in matters where people seek access to the right to stage peaceful demonstration and assembly. MHRC investigations established that gross human rights violations took place before, during and after the 20 July demonstration which resulted in the death of 20 people and destruction of a lot of property.